For example, the kid in the picture? Looking all confused? Not an exceptional needs child! Yesterday, I took my actual special needs child to a religious retreat to prepare for his First Communion. The leader of the retreat had kindly called personally to invite us, even though it is hosted by the school and we are homeschooling. She assured me that she knew there were special circumstances. Mom Mistake #1: Not adjusting the times. Before we even arrived, I had a nagging sense that I had made a mistake. The retreat was scheduled at 8:30. That means we have to have meds before 7 a.m. to cope like reasonable human beings. I had let him sleep in a bit (as sleep is so necessary for an epilepsy child, as lack of sleep triggers seizures). So the meds were not yet working. The girls instantly ran up and showed my kid love. I think he was overwhelmed but happy. Then the adults had the boys go one way and the girls another. My kid is a boy, but most of his friends are girls. He was very sad to come to finally see his friends, who he misses since he left the classroom, and to see the boys, all older and none his friends, instead. Mom Mistake #2: Not intervening to insist he stay with his peers, the younger and friendlier girls. I don't know why I didn't intervene. Frankly, I knew that he needed his friend, but also knew that a 1,001 parent volunteers (okay, that's an exaggeration - 25 or so) would say, "oh, the boys are over there." By mere chance, there are only a handful of boys in the class. By design, more of the parents of boys held them back for maturity reasons or started them in school late. My child is already the youngest in the class, so this meant sitting with kids a full year or more older than he is. Also, how do you explain that YOUR OWN KID gets special privileges? Would the intervening parents make him uncomfortable? People don't understand that accommodations put kids with special needs on a level playing field. Help get that word out by sharing this post, okay? Mom Mistake #3: Not pulling the parent volunteers aside and informing them not to address him. I'm from the South, and here, it's considered pretty rude not to address people. I'd be asking a lot. But since I didn't ask, people keep urging him on. "Don't sit in the back with your mom. Come to the front where you can see!" "Just try the art. It doesn't matter if you can't use the scissors." "Don't you want to sit at the table?" Honestly, most showed up after we started and couldn't have been pulled aside. Mom Mistake #4: Not taking a break. But as the urging ramped up, I saw my kid get stressed. I saw him hang on me for protection. At this point, he was trying to pay attention to the movie they were watching, but he was getting annoyed. I should have taken a break. Smiles of silent encouragement to me. Someone quietly bringing me the art project to slip in my bag for later. Words, while well-intended, added to the stress. Silent encouragement is the kindest. Bring this point up with adult friends at dinner. Explain that words can come off as overwhelming or judgmental to the child and the caretaker. On the other hand, a silent smile or look of encouragement is unlikely to harm, and might be desperately needed. Nobody knows that child as well as his or her caretakers. Nobody. I don't care if you are a psychiatrist with 20 years experience teaching 7-year-olds and the parent of an exceptional needs child of your own. You don't know that my kid is experiencing an increase in absence seizures and having to drink the vilest tasting medicine in the history of mankind and swallow 12 large pills per day. You don't know that at 9:30 a.m., he will suddenly warm up and participate enthusiastically, as long as no one scares him by speaking to him before that. You don't know that his attention level is about 40% between seizures and ADD, so he doesn't even know that an art project was assigned. Mom Mistake #5: Not briefing the organizer on accommodations that would be needed in advance. You don't know that his tremors are worst from the epilepsy meds and his core strength is down, so he fell getting out of the car today and cannot walk in a straight line behind the other boys or navigate the maze of chairs in the classroom. We all need to be mindful of the experts on the condition of an exceptional needs child - the parents. Take your cues from them. Rules matter. I'm a lawyer. I'm a formerly certified school teacher. I adore rules. Rules give society order. But most rules are arbitrary, and while they make sense for the herd, some individuals cannot conform. That's why we have handicapped parking spaces, for those who cannot get into the store by parking on a first-come, first-served basis. Even the strongest proponent of vaccines realizes that there are a handful of kids who cannot be vaccinated. Mom Mistake #6: Valuing my kid's privacy over his needs. I should have said, out loud, that he has special needs and others needed to avoid addressing him. "But practice doesn't end until 11:30." "Kids must sit in assigned seats." My sweet 7-year-old had to be physically restrained for a few minutes in the hallway. He kept trying to run away out of the building and into the road. Finally, I calmed him enough to bring him, alone and in an empty church, to show him what to expect tomorrow. He tasted the unconsecrated host (a cracker, for non-Catholics) and spit it on the floor before we left. Those of us who feel that compulsion to comment need to take a deep breath - and hush! I beg of you, please bravely share this post with someone with a child with exceptional needs...and with someone kind and well-meaning, who would benefit from hearing this ahead of time, before they try to help! Here, here! -- thank you, well-said, and Amen! I originally navigated to your site for some planner tips and inspiration, but my thoughts were re-routed when I caught a glimpse of the link to this post out of the corner of my eye. As someone with two exceptional-needs siblings (an older brother and younger sister), both with separate uncommon and extremely unique special needs which are not always instantly apparent to the naive public majority, I couldn't agree with you more! I will be sharing this post shortly, and I am eager to see what else I can find on your site/blog! Sharing this for a dear friend whose child has special needs. I think this applies pretty universally. I think one thing she missed, that I have to say, people around here are pretty good at...approach the parent, not the child, when trying to help. Ask "Would it be helpful if I blah blah blah." Sometimes it is helpful if someone else asks something and sometimes not. Under no circumstance, ever, know matter how well you think you know the child, should you circumvent or take over what the parent is trying to accomplish. You can send an unstable situation into an out of control one as well as grind into the already overwhelmed emotions of the very stressed parent. 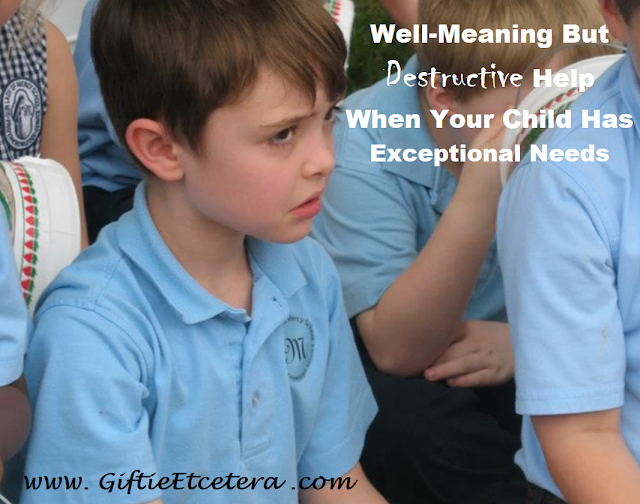 DogDoc, make sure to check out http://www.giftieetcetera.com/2015/10/when-kids-are-exceptional-but-adults.html. Also, click the "parenting" label (below the post) for more. This is such a great post! I think it's really important for you as the parent to advocate for what your special needs child needs, because like you said: no one knows that child like you do and no one is better equipped to help him (or at least clue others in on how they can help, too) like you! I don't have a special needs child but the same philosophies of speaking up and advocating for our children are true for all. Although my children are still young, I've seen too many adults make rash judgments or intervene at school or activities when they just need to offer support instead. Thanks for linking up with Funtastic Friday. Thank you so much for sharing such an honest and vulnerable post with us at the Over the Moon Link Party. Your view on this situation allows those of us on the outside of your life to have more understanding. For this reason, I've chosen your post to be a Featured Blog Post at the Over the Moon Link Party. Come on over tomorrow and grab your badge. I appreciate the information. I would probably be one of those people (not understanding)) trying to make your son and you feel comfortable by talking and trying to encourage (with words). Silence is not always my 'go to' setting. However, now that I know that a quite smile can go further than a verbal cheer leading - I can add that to my knowledge bank. I am sure it is difficult to talk about this but the advice was well worth it. Some of us will hear it.